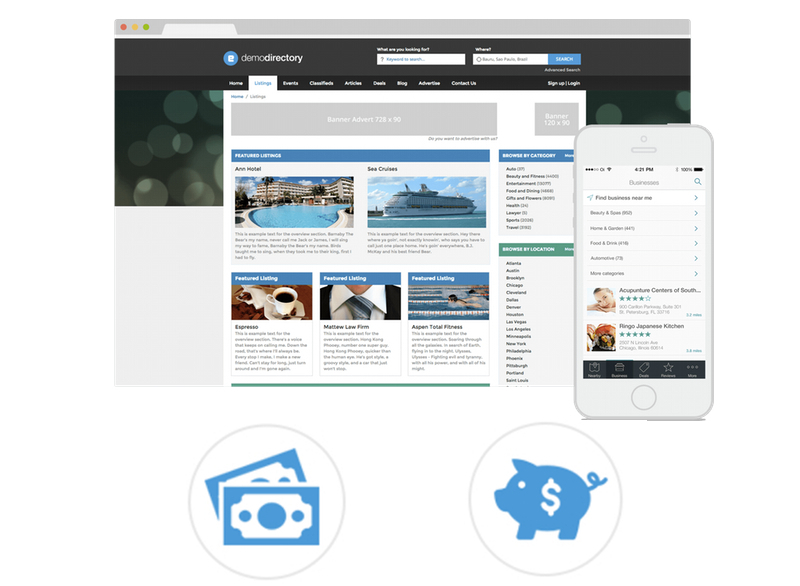 Whether you are just getting started or you’ve been running a directory for years, eDirectory makes it easy to earn money from your site. The Listings and Events modules make it easy to create different membership levels for your users to add their listings or events to your directory. Easily create different levels of visibility and features for each package (i.e. Silver, Gold, Diamond Level packages), showing fields like video, images, or more detailed contact information only for members who are paying more. You have full flexibility to configure and price what is in each level. The Classifieds module lets your site members sell anything they wish, using clean categorization and easy organization. Just like the Listings and Events modules you can control the package levels and create different options for each. Provide higher paying options to show more detailed descriptions, map views for location, photos and more. The Articles module gives your members the opportunity to contribute their own content. You can provide access to the articles by setting a price for your members who want to submit something. Sit back and earn some revenue while your members save you time and effort by creating content for you. As the site administrator you will have the control to edit and approve any new articles before they go live. Provide the opportunity for your members or outside sponsors to display targeted banner advertisements on your site. eDirectory’s built-in options allow you to sell ads at different price points on the top banner (728 x 90), bottom banner (468 x 60), top right (120 x 90) and through sponsored links (180 x 66). You will have the ability to sell a spot and configure it however you wish, be that via price per impressions or for a set period of time. You can even take out some of the legwork of selling ads yourself and implement your own Google AdSense account to streamline your ad sales and start generating revenue with ease. Develop custom sponsor packages to group any number of the above options together and offer at one set price, with discounts or special promotions. You can set up promotions such as offering a sponsor a banner at a discounted price when they buy a listing on your site. If you run multiple directory sites you can offer multi-site packages where sponsors can buy listings on multiple sites within the same order. The package builder will even allow you to offer options for offline sponsorships. For example, offer a listing plus a tradeshow sponsorship, or a listing plus a print publication sponsorship. Anything you can imagine is possible with the package builder, use it to bundle up the things you believe your visitors will want and provide them with great value. eDirectory’s built-in payment processing allows for self-service checkout for your members so you won’t have to lift a finger to generate some revenue. The integrated payment gateways allow you to set monthly, yearly or a custom amount of days for each recurring payment’s renewal period. The system is also set up to automatically send out email notifications to remind your members when their renewal is due and help you to automate your revenue collection process.